Tampa's Cafe Kili Voted No. 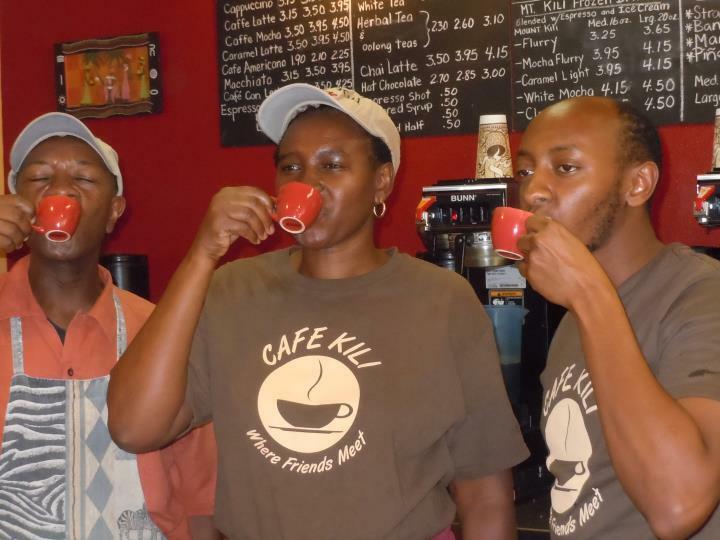 9 Coffee Shop in U.S.
Cafe Kili owner Rose Waruinge enjoys a cup o' joe with husband Patrick, left, and son Anthony. The owners of Cafe Kili got an added jolt over the weekend -- and it wasn't just from the java. The Temple Terrace watering hole was voted the ninth best independent coffee shop in America by Huffington Post readers. (The survey is ongoing. At the time of this writing, Cafe Kili sits at No. 5, as seen in this slide show.) The survey marked National Coffee Day, which was Saturday. The daughter of Kenyan coffee farmers, Rose Waruinge opened Cafe Kili with her husband, Patrick Gachau, and their two sons in 2007. It quickly became a popular hangout among students and employees of the nearby University of South Florida. In addition to serving beverages and food, the eclectic cafe is known for selling Kenyan crafts, hosting concerts and displaying the photos of fallen military members, including the owners' son Marine Lance Cpl. Kevin Gachau Waruinge, who died in Iraq in 2005. For their part, Waruinge and Gachau commemorated National Coffee Day by offering patrons a free cup of joe with a $3 food purchase. Florida ranks as a C-minus for its susceptibility to corruption, according to a new study by the Center for Public Integrity, Public Radio International and WLRN in Miami. WLRN reporter Kenny Malone reports on a loophole in Florida's lobbyist gift ban. Florida has one of the strictest rules in the country for lobbyist gift-giving: an absolute ban. And the state has one of toughest laws for campaign contributions: a $500 limit. "Bring it on!" That was Michelle Faedo's response when asked if she would put her Cuban Sandwich up against one from Miami. WUSF interviewed Michelle and her husband, Robert Faedo, when Tampa City Council was considering its vote to make the "Cuban" its signature sandwich in April.